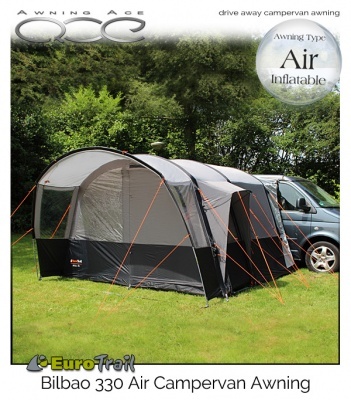 The 2018 EuroTrail Bilbao Free Standing Campervan Air inflatable awning is probably the most complete drive away air awning available throughout Europe. 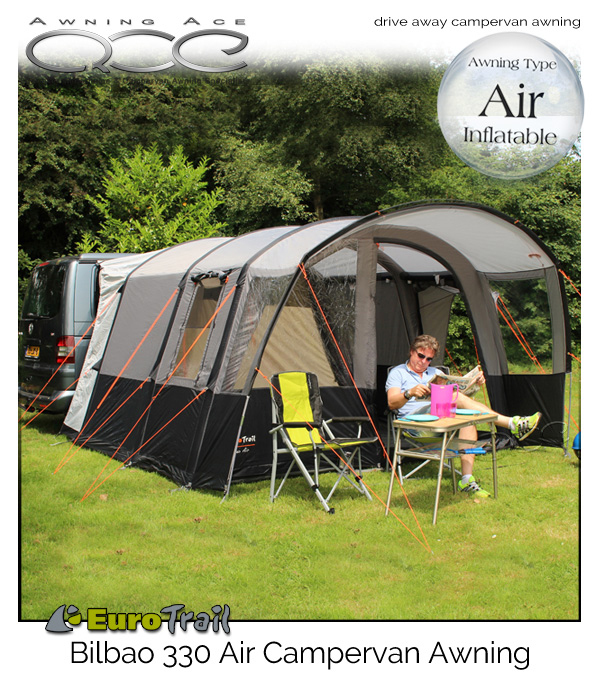 Manufactured in the Netherlands the Bilbao utilising super strong and very durable inflatable air tubes sewn directly to the inside of the awning fabric, so you'll never leave a pole at home again!. Carefully designed to make the awning easy to use and simple to pitch, the Bilbao's coated polyester 185T fabric with heat sealed seams is strong, durable, UV stable and waterproof. 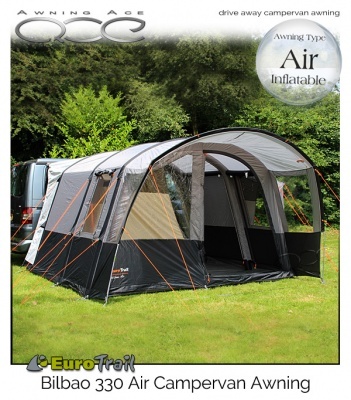 The inside of the awning is light and airy with plenty of ventilation provided by secondary fly mesh window vents. Each window has an external zipped window blind to provide plenty of privacy when required and the rear of the awing accommodates a large cotton blend two-person inner bedroom tent (140 x 210cm) for the perfect nights sleep under the stars. The front entrance wall has a large access door which can easily be rolled to the side, and a very large half window panel making for superb views. The window has an internal privacy blind which can be rolled back or closed for privacy or shade when required. The front sun canopy provides an extra large covered seating area on sunny days and wet weather protection when the weather isn't so good. it's the perfect place to take off your wet weather gear and walking boots and ensures the awnings living area remains protected whatever the conditions. The connection cowl wall can be completely closed when you leave the awning on site without your vehicle for security or can be roll halfway or all the way back making even more space inside your awning. The internal living height is 225cm giving plenty of headroom throughout. A covered side entrance door completes this superb package with a rain canopy for extra protection and shade. Suitable for low height campervans and van conversions with an awning connection height of up to 210cm making this ideal for Volkswagen T2, Volkswagen T3, Volkswagen T4, Volkswagen T5, Volkswagen Transporter, Volkswagen California and Caravelle, Ford Transit, Vauxhall Vivaro, Mazda Bongo, Nissan NV200 & NV300 and many more. The brilliantly simple 7mm awning connection beading allows for extremely fast attachment and detachment from your vehicle when fitted with any multi-rail or standard awning channel/profile. The connection beading accommodates a full-length heavy duty zip which means you simply zip the awning off of your vehicle and zip it back on when you return, how easy is that! 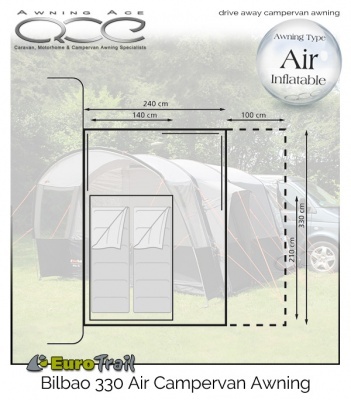 The EuroTrail Bilbao also comes complete with a connection rod which slips simply into a pre-sewn sleeve and can be used with sucker or magnetic roof clamps to secure your awning directly to your vehicle (clamps not supplied). Guylines can also be attached and thrown over the vehicle and pegged out or tied to your vans roof bars or rails. To fit awning rail/connection heights: up to 210cm. Canopy Poles: Fibreglass pole sections. 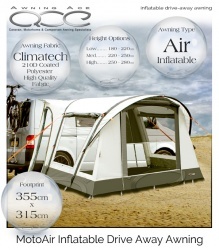 Camptech MotoAir Low is suitable for campervans and motorhomes from 180cm to 210cm in height, The awnings rear tunnel is fitted with dual awning beading (both 4mm and 6mm) so can be attached directly to your Fiamma or Omnistore roll-out canopy or attached directly to standard awning rail. 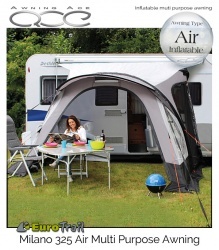 This spacious awning offers a superb level of comfort during your precious breaks and holidays. With a very useable 325 x 265cm footprint, the 2018 Milano inflates in seconds with the high capacity pump provided. 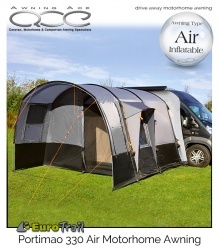 This awning is extremely adaptable and sits equally well on either a caravan or motorhome with a connection height between 250 -280cm. The 2018 EuroTrail Portimao Free Standing Motorhome Air inflatable awning is probably the most complete drive away air awning available throughout Europe. Manufactured in the Netherlands the Portimao utilising super strong and very durable inflatable air tubes sewn directly to the inside of the awning fabric, so you'll never leave a pole at home again!. Carefully designed to make the awning easy to use and simple to pitch, the Portimao's coated polyester 185T fabric with heat sealed seams is strong, durable, UV stable and waterproof. Brand New 2018 Model - Now with removable tub groundsheet. Available in three height options, the Camptech MotoAir is suitable for campervans and motorhomes from 180cm to 280cm in height, just choose the model that best suits your vehicle.